KK and D are 2 cousin from Compton, Ca. who made a major impact on rap music in 1991. 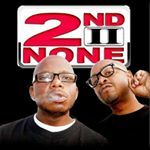 With their self entitled debut album "2ND II NONE" the 2 have been trusted and love ever since. Today they celebrate 25 years of music success. KK and D still perform their fans favorite hits in the United States and Europe. Demographic data for @2ndiinonecpt's audience is available for free to influence.co users.